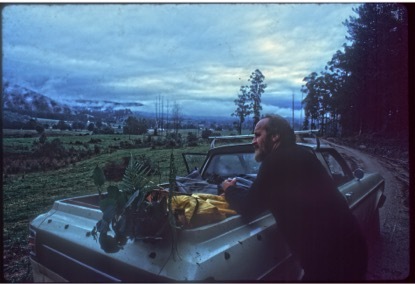 Oliver also styled and snapped this photo of his father paying homage to Bill and the photo that David took of him on a plant and seed collecting trip in northern Tasmania in 1975. 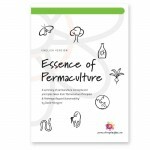 Radio National’s Blueprint for Living had a segment called ‘Farewell to the father of the global permaculture movement’ devoted to Bill Mollison and featured David talking about Bill and more broadly about permaculture. Samuel Alexander wrote a piece for The Conversation about Bill entitled ‘A revolution disguised as organic gardening’. Declan Kennedy’s tribute, I am mourning my friend Bill Mollison is also well worth a read. 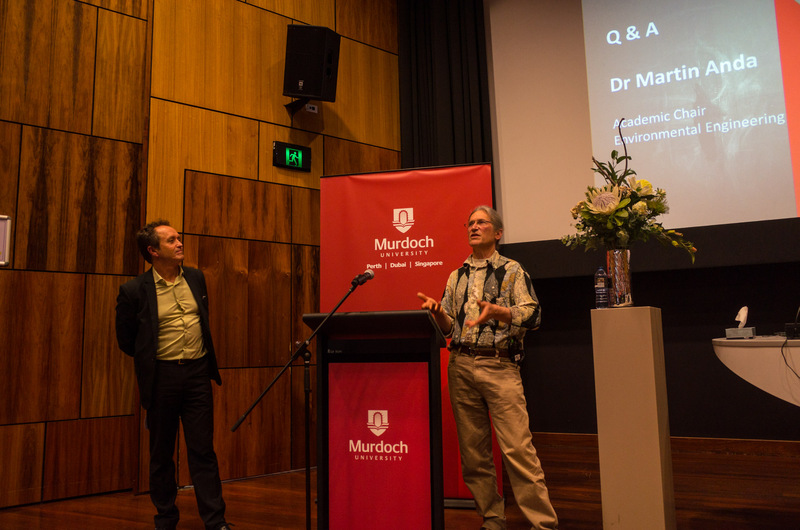 Award-winning Australian writer, editor and anthologist Bruce Pascoe is leading a movement of researchers that is rewriting Aboriginal history in Australia. 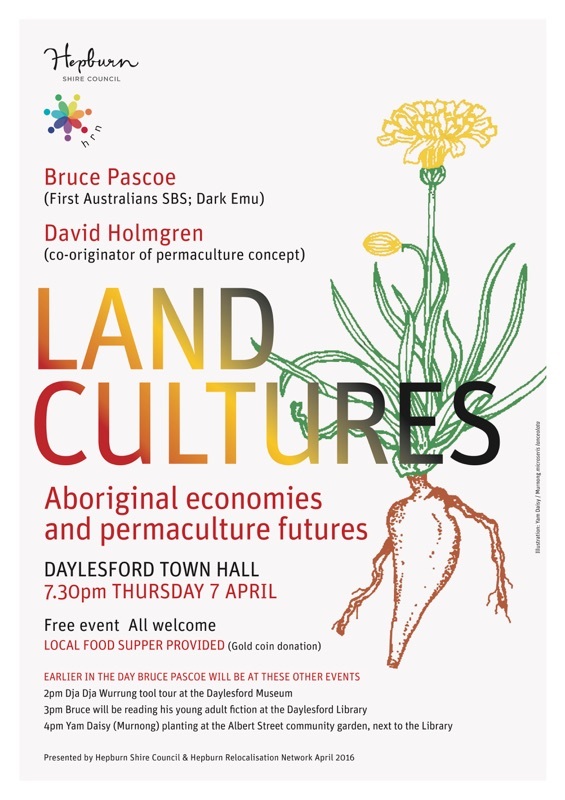 On Thursday April 7 2016 Pascoe will visit Daylesford for a series of free events including Land Cultures: Aboriginal economies and permaculture futures at the Daylesford Town Hall at 7.30pm – Bruce Pascoe in conversation with David Holmgren. The evening event will commence with a Dja Dja Wurrung smoking ceremony and Welcome to Country. A Hepburn Shire Council representative will present a progress report on the Shire’s recognition and reconciliation projects. 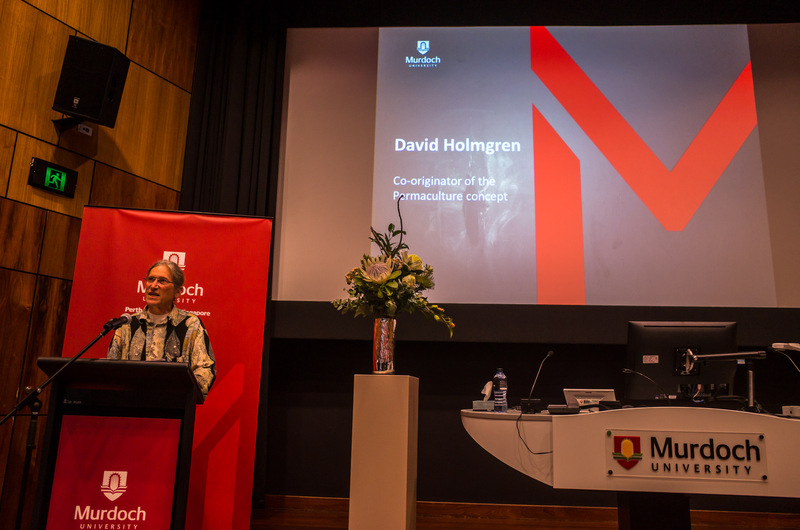 Pascoe’s keynote address will be followed by a response from David Holmgren, before opening the discussion to the floor. Supper will be provided by Hepburn Relocalisation Network (for a gold coin donation). 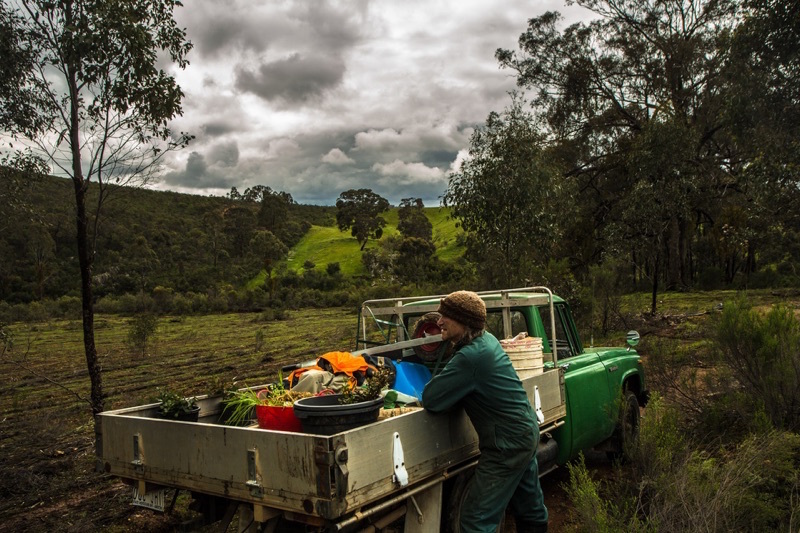 Come and join the discussion and understand how the foods of Australia pre-1788 may become the foods of a climate-altered 21st century economy that acknowledge and celebrate the past. You can join the Facebook event here. 2pm tour of Dja Dja Wurrung tools at the Daylesford Museum. 3pm reading by Bruce of his young adult fiction at the Daylesford Library. 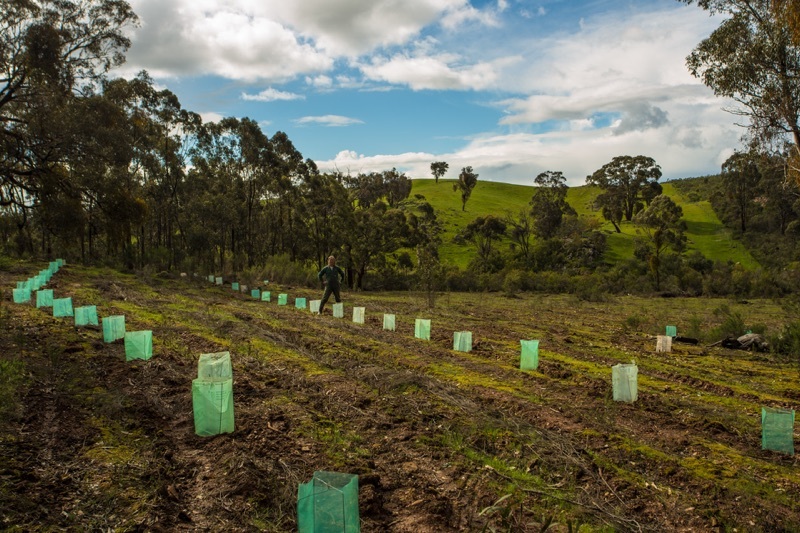 4pm planting of murnongs (yam daisies) at the Daylesford Library community garden. 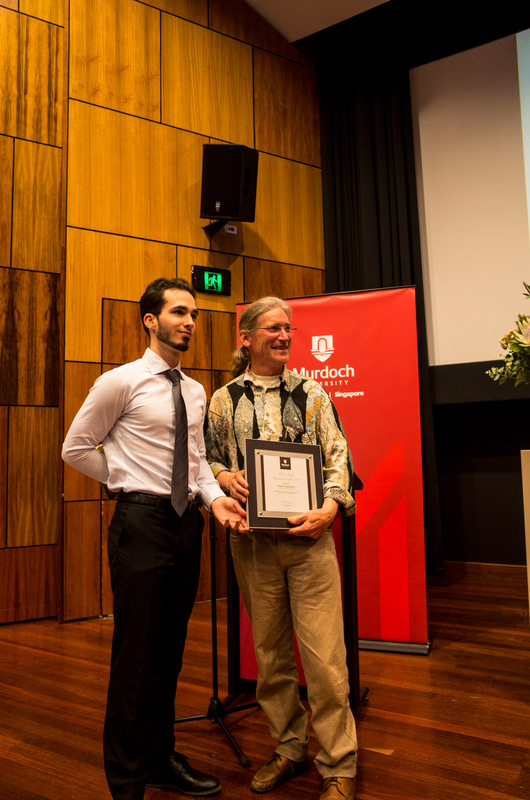 All events are presented by the Hepburn Relocalisation Network with the generous assistance and funding of the Hepburn Shire Council. 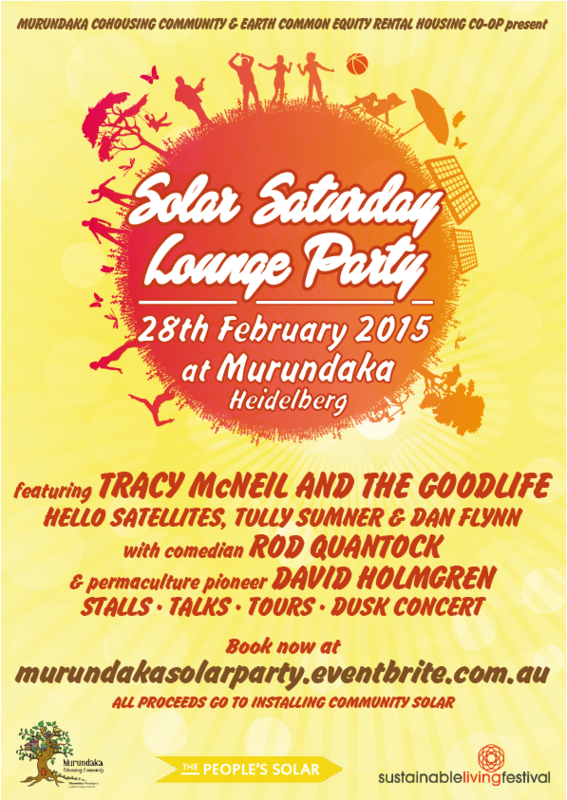 Bruce Pascoe has a Bunurong and Tasmanian heritage. In his latest book, Dark Emu: black seeds, Pascoe shows that the Aboriginal history we were taught in school — that indigenous Australians were chancey hunter-gatherer nomads — is a fiction. Using point of contact journals by European explorers, Pascoe demonstrates the extent of the ecologically sensitive agricultural practices that existed in Australia pre-1788, and shows that Aboriginal Australians were possibly the world’s first bread makers, preceding the Egyptians by at least 18,000 years. About one hundred people gathered on the steps of the Victorian parliament house on 19 Feb 2015 to rally for fair, real and local food. Organised by Regrarians, the rally attendants heard from Lisa Heenan (Regrarians), Costa Georgiadis (Gardening Australia), Cyndi O’Meara (Changing Habits), Joel Salatin (Polyface Farms), Tammi Jonas (Jonai Farms), Reg Matthews (Miranda Dale dairy), Lorraine Pratley (Australian Raw Milk Movement) as well as David Holmgren and Su Dennett from Melliodora. For those people who missed the great day of action in Melbourne, here’s a video recording of the whole rally. One of the ways to make sense of long distance traveling is to maximise the purposes of the trip. In a similar way that filling the car with passengers when one needs to drive somewhere gives maximum fuel efficiency, when David travels for a speaking engagement he hopes to appear more than once. 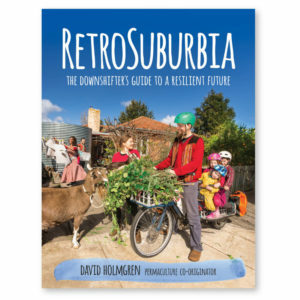 So when it was announced that David Holmgren was to give a talk in Australia’s capital city, you might have wondered what would be his other engagements and programs while in the region? 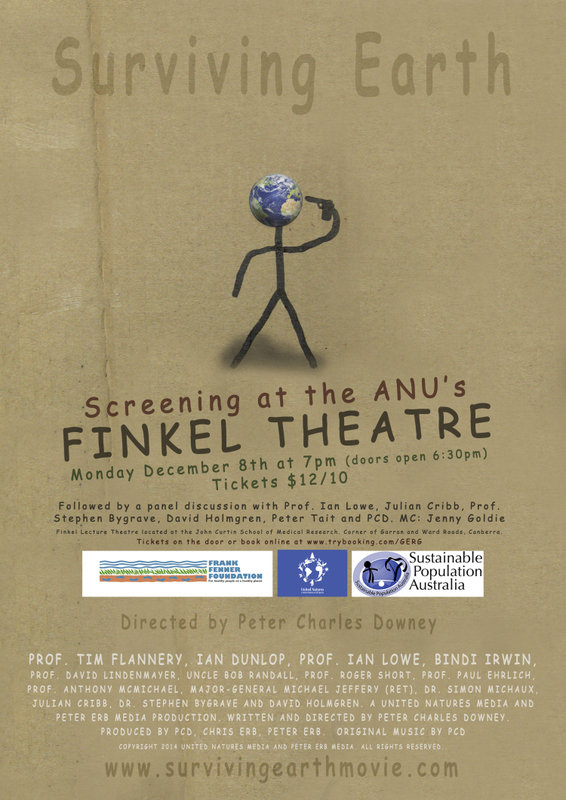 Well, on the evening before the “Future scenarios and solutions” talk in Canberra, the renowned film director Peter Charles Downey is going to show his new film, Surviving earth, in which David is featured, so David will be taking part in a panel discussion following the screening, along with Prof. Ian Lowe, Julian Cribb, Prof. Stephen Bygrave, Peter Tait and the director, Peter Charles Downey himself. 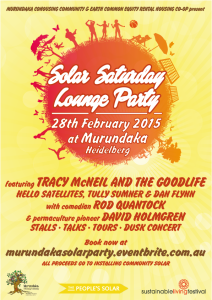 MC is Jenny Goldie from Sustainable Population Australia. 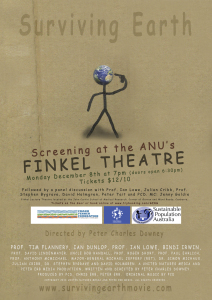 If you are in the zone, come and join him on Dec 7, at Finkel theatre, ANU. 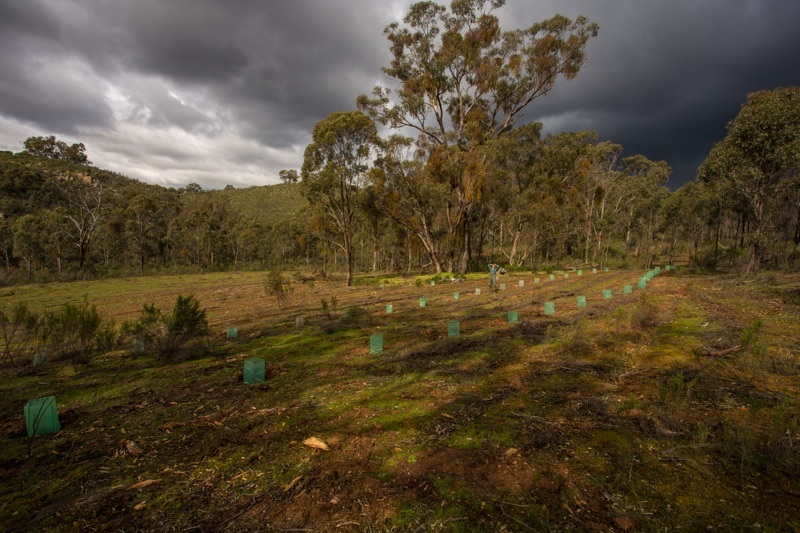 On the day after the talk on 9th Dec, David will be touring a great example of good local land care .